When I need something to snack on, I try to reach for fresh, raw vegetables. Mainly because they are incredibly good for me, but also because their high fiber content can fill me up and prevent me from getting down and dirty with a not so Weight Watchers friendly food. 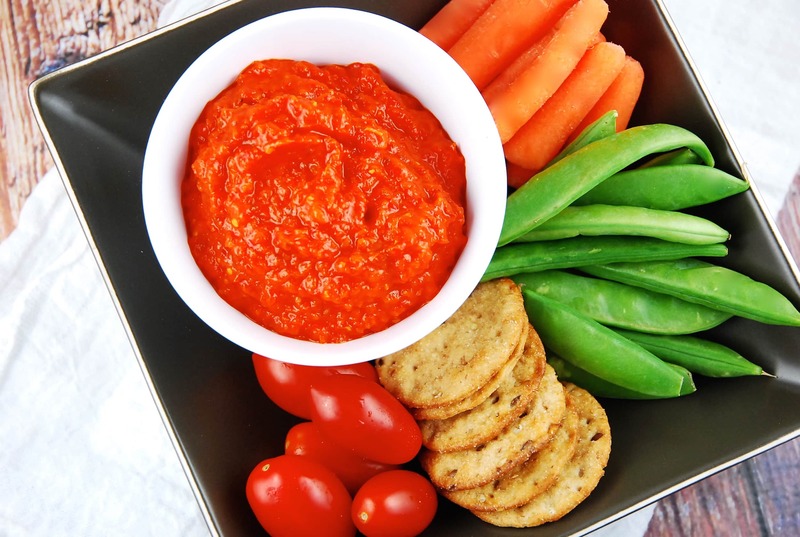 So when you eat fresh veggies as much as I do, you are constantly on the lookout for delicious, exciting, and low calorie dips to dunk them in. And this Red Pepper and Eggplant Dip Recipe has become one of my favorites! The roasted bell peppers and eggplant add a lovely smokey flavor, while the garlic and lemon juice tie it all together with a brilliant zing. Not only is it delicious and nutritious, but it’s super low in fat and calories, so I don’t need to feel guilty about my heavy dipping. This Red Pepper and Eggplant Dip makes a fantastic dunk for not only fresh veggies, but pita wedges, crackers, cheese…just about anything, really. You can also smother roasted vegetables or meats with it too, if you are looking for a way to give those foods an extra kick. You really can’t go wrong with such a light and healthy dip! Bold, fresh, and incredibly light, this healthy red pepper and eggplant dip is as beautiful as it is delicious. Serve as a dip or over roasted vegetables and meats. Preheat oven to 400 degrees. Line a large, rimmed baking sheet with parchment paper and mist with nonfat cooking spray. Place bell peppers and eggplant on baking sheet, and roast, turning once or twice, for about 40 minutes, or until eggplant is very soft and bell peppers are charred. Transfer to a large metal bowl or a brown paper bag, cover tightly with plastic wrap, and let rest/steam until cool enough to handle. Peel skin from eggplant and bell peppers, and remove seeds from bell peppers. Place all vegetable flesh in a food processor. Add in remaining ingredients, and pulse until well combined. Transfer mixture to a large sauce pan, season as desired with salt and pepper, and simmer over medium heat for about 15-20 minutes, allowing the dip to reduce down to about 2 cups. Allow dip to cool, then transfer to a bowl, cover and refrigerate for at least 1 day before serving. This sounds amazing. I just bought something similar from Trader Joes and I’m excited to try to make my own now. Thanks!